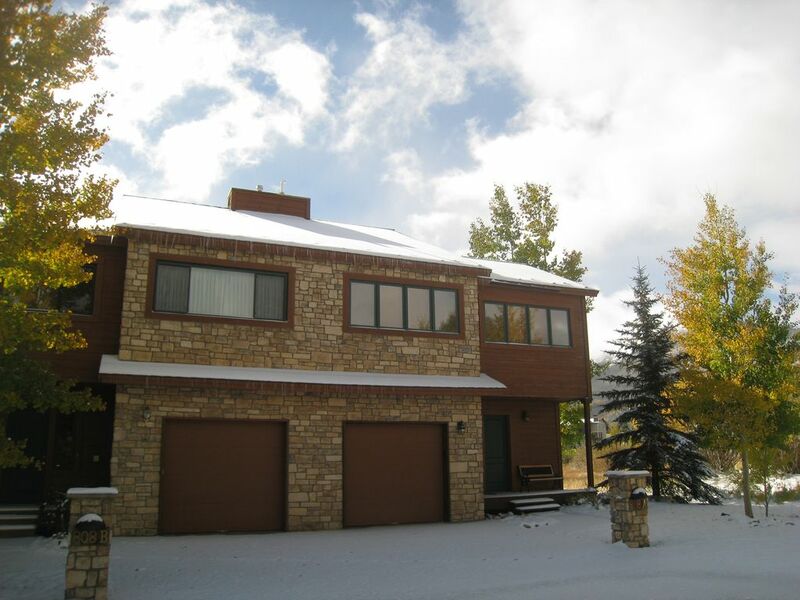 LakePoint Hideaway, nestled in the heart of Summit County is a three bedroom, three full bath, our very own private hot tub, one car private garage, and driveway parking home is conveniently located next to the recreational path around Lake Dillon. Surrounded by a myriad of enjoyable winter and summer activities making it an ideal place for vacation getaways. Just off of I-70 and Frisco exit 203, this location provides convenience and luxury with an excellent combination of fantastic mountain views, privacy, and easy access to the surrounding Summit area. This condo is only minutes away from Breckenridge, Copper Mountain, Keystone, and Arapahoe Basin ski resorts, with the free shuttle service within 300 yards of the front door. Vail and Beaver Creek are about 20 minutes West on I-70, and Denver is just 75 minutes East on I-70. You will be located close to Breckenridge, Copper Mountain, and Keystone, cross country skiing; snowmobiling; Golf courses; biking; hiking; horseback riding; white water rafting; jeep tours; Frisco Marina; Silverthorne Outlet Factory stores; and the resorts Recreation Centers. LakePoint Hideaway is a custom built home, with over 1,800 sqaure feet, and includes exclusively high quality amenities to make your stay more than enjoyable. There is slate tile and beautiful woodwork throughout our home. The main floor is an open plan with hardwood floors and knotty pine ceilings in the family room, kitchen and dining area. A natural log beam banister and railing leads upstairs to the bedrooms. It is a 3 bedroom, 3 full bath home with a fully equipped kitchen for all your cooking needs during your stay. Sleeping accommodations include a king bed in the Master with a private bath and whirlpool tub. The second room has a queen bed. The third room has two sets of twin bunk beds, sleeping four. There is also a queen sized sofa sleeper in front of the fireplace in the great room. This condo provides magnificent views from every room of either the Continental Divide to the East, or Mount Royal, Buffalo Mountain and the Peaks to the West. A private 8 person hot tub is just steps out the back door. Our home has been decorated to provide a warm and comfortable place to relax and recuperate after a fun filled day of mountain activities. We look forward to having you enjoy your stay in Summit County. Frisco, Colorado is centrally located to numerous towns in Summit County and the surrounding area. The location offers the convenience of amenities with the privacy and respite of stunning natural mountains and Lake Dillon nestled in the valley of the ranges. Our condo is located within easy access to Loveland, Keystone, Copper Mtn, Breckenridge, Arapahoe Basin, Vail and Beaver Creek resort towns. Amazing scenic views are experienced from the privacy of our backyard and private hot tub overlooking the Nature Reserve. The summer activities are just as plentiful to include a variety great hiking and biking trails. We enjoy staying in Frisco as the town and surrounding areas hosts a variety of activities, musical, art, and food festivals throughout the year. We find Frisco is an amazing place to unwind, relax, and recharge as you experience the great outdoors. We love the close proximity to many outdoor activities, including skiing, snowmobiling, hiking, biking, rafting, and golf. The fantastic mountain fresh air along with the many winter and summer activities make this an ideal spot for a getaway in the Colorado Rockies. We love the tranquil setting with the amazing views of the surrounding mountain ranges and the Continental Divide, just steps out our back door. We back up to an open Reserve space and thus no-one is located behind our home just a vast view of the surrounding mountain ranges. Frisco is centrally located in Summit County with easy access from Denver and to all the major ski resorts and towns. Two baths located on the second floor and one full bath with shower located on the main floor. One block from the recreational path walk, bike, cross ski, snowshoe around Lake Dillon. In-floor radiant heat provides the most efficient and effective heating system. Gas fireplace that easily and quickly heats and can help take the chill off . Private garage with direct access to the home & driveway parking. Private Garage and driveway access with the private garage providing plenty of storage for all skis, boots and sports equipment. 4 TV's. Main TV is 4K UHDTV connected to a DVR and DVD. All TV's access HD channels and are flat screen. Two other bedroom TV's also have DVD. Great views of the surrounding mountain ranges from the deck and private hot tub, to include the Continental Divide, Peaks leading into Breck, Copper. Our home is two stories with the private bedrooms located upstairs. The queen sofa sleeper and full bath with shower is located on the first floor. Our very own Private 8 person hot tub overlooking the mountain ranges just steps out the back door. Great place, great location and very attentive service from the owner. First time to stay in Frisco, and we will definitely do it again. Everything is convenient, and very easy to get to ski areas. We hiked for the first time on a winter trip, and this location was just a few minutes away from some great trails. A bushy-tailed fox came to see a couple of times during the visit, and that was great. We stayed here for a few days and it was absolutely outstanding. The couple we were with had never been to the Rocky Mts before and this was a good experience. The owners were very helpful via emails, texts & phone conversations. The home is stocked very well with all the necessities. The private hot tub was over the top after a day of outdoor activities. The house is very private and backs up to a beautiful natural area. We would stay there in the future. This 3 bedroom, 3 bath condo comfortably slept 9 of our ski party (4 adults, 5 kids including 4 teenagers), with plenty of storage in the attached garage for all our ski gear. The location in Frisco is perfect-just down the road from busy Breckenridge and close to Keystone and Copper and about an hour's drive from Vail. Plenty of stores and restaurants nearby. The rooms are spacious, and the condo is very well equipped (washer/dryer, towels, pantry with things we forgot at the store :)). Electric fireplace and outdoor hot tub are great extras. The owner was extremely helpful in providing information about restaurants and activities in Frisco and surrounding areas well before we even left for Colorado and was available throughout our stay to answer questions. Would definitely return in the future and recommend to others!!. This is a great location to base a summer vacation in Summit County Colorado. This is close to Lake Dillon and its many activities. Frisco has bike rental, groceries, restaurants and more very close to the condo. It is easy to go to Keystone, Breckenridge and Copper Mountain. Hiking trails, bike trails, boating. Great activities very close by. The condo is very nice, very good furnishings, appliances, kitchen, pantry. The view and large windows are great. Owner keeps the place in great shape. With 3 bedrooms our group had a comfortable fit, and the 3 bathrooms were very helpful. Owner instructions make it very easy to get acquainted with the condo and make everything functional. Getting on WiFi was very simple. In summary, a super place to stay. Wonderful home - Close to everything! We enjoyed our stay at the LakePoint Hideaway. Angela is very helpful and knowledgeable of the area and provided many tips about things to do. The location is very private and convenient as well. The home offers great views and it was clean, nicely decorated, and well stocked. My family of 5 thoroughly enjoyed our ski trip and the Frisco area. Location, Location, Location and MORE! Perfect spot for our ski trip, but beyond location was the great place itself! Loved everything about it -- especially the hot-tub, wonderful beds, well-equipped kitchen and full-sized washer/dryer. Also Angela is very personable and nice. Would definitely stay again and recommend to friends. No Pets and Non-Smoking Unit Note: 1 to 2 night stays may be acceptable if in between booked stays. Rates are subject to change until reservations are confirmed. A refundable security deposit is required with the second half payment. After a clean inspection of the property the deposit will be refunded within 7 days. A premium rental rate will apply to all holidays and weekend stays. Additional guests charges may be applicable. Christmas and New Year premium rates and required stays.